Chris is the author of the book "101 Crucial Lessons They Don't Teach You in Business School," which Business Insider wrote is "the most popular book of 2016 according to Business Insider readers." In 2015 Forbes called this book "1 of 6 books that all entrepreneurs must read right now." Forbes calls this book 1 of 6 books that all entrepreneurs must read right now (along with Peter Thiel's book and the 7 Habits of Highly Effective People). In this book you will learn how to get a meeting with anyone. You will learn how to take your career to the next level. You will learn how to reinvent yourself in ways that you never thought was possible! 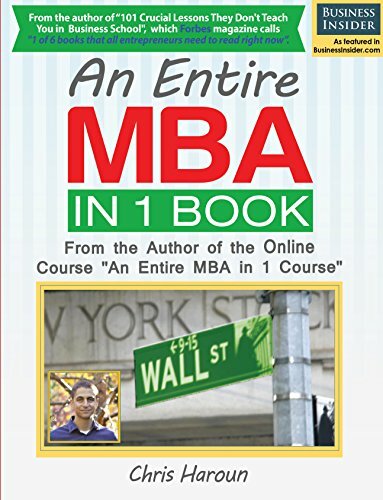 This is the book version of the popular online course called "An Entire MBA in 1 Course" by Chris Haroun, who is an award winning MBA Professor. This book will teach you everything you need to know about business….from starting a company to taking it public. Most business books are significantly outdated. This book leverages many online resources and makes the general business, accounting and finance process very easy to understand (and enjoyable too)! The Ultimate Practical Business Manual will teach you everything you need to know about business….from starting a company to taking it public. Most business books are significantly outdated. This book leverages many online resources and makes the general business, accounting and finance process very easy to understand (and enjoyable too)! This book will focus on an introduction to business law for entrepreneurs. This book is a great very high level introduction to the law topics that are most important to entrepreneurs, including how to register a company, how to protect my family, patents, term sheets, dealing with investors and much more; the course assumes that the reader has no background in law! Many business concepts are simply common sense. This book will focus on high level consulting concepts that you need to know that might not be common sense! This book is a great introduction to consulting and assumes that the reader has no background in consulting! Most business books are significantly outdated. This book leverages incredible online resources and makes the whole consulting process very easy! Many business concepts are simply common sense. This book will focus on high level accounting concepts that you need to know that might not be common sense! This book is a great introduction to accounting and assumes that the reader has no background in accounting! Most business books are significantly outdated. This book leverages incredible online resources and makes the whole accounting process very easy!